The biggest feature of Apple Watch Series 4 is the ability to take an electrocardiogram (ECG), which can record electrical signals in your heart, an option first made available to the United States, and recently Europe and Hong Kong. While Canada was absent in the recent expansion of the Apple Watch Series 4 ECG app, we do know the feature is ‘coming soon’ if a recent update from Health Canada is to be believed. “Apple has communicated that they are working to bring the Apple Watch heart features to Canada soon. However, to date, Health Canada has not received an application,” according to a recent response to iPhone in Canada founder, Gary Ng, on Twitter. 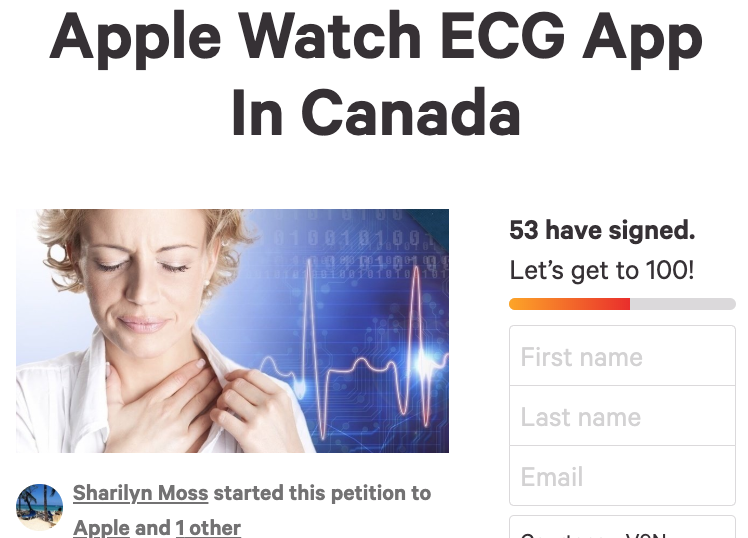 Some Canadians are so eager to get the ECG app here they have started online petitions urging Apple to bring the feature to Canada. Already the ECG feature has detected heart issues in various Apple Watch wearers in those countries which in turn has saved their lives. Unfortunately the ECG feature of the app is not available in Canada and it seems that Apple has not yet applied for use within Canada. It’s time that this ECG feature becomes available for Canadians! This is something that could save lives that might not be there by the time Apple finally enables it if they go at their own pace without prodding. Both petitions so far, do not have much traction. While signing an online petition may not do much to advocate for any real changes, it does communicate your support for a certain cause. For Canadians hoping for the ECG app with Apple Watch Series 4, you’ll have to be patient and keep your fingers crossed for possible announcements at WWDC 2019 or this fall’s expected iPhone event. Remember, it only took 3.5 years for the Apple News app to launch in Canada.